Great Actor, One of My Favorites. He will Definetly be missed. Wasn't a huge fan of his, except for The Ten Commandments, amazing movie. But he was a legend for sure. He came from the best age of Hollywood in my opinion and he was one of the best. Will definitely be missed. 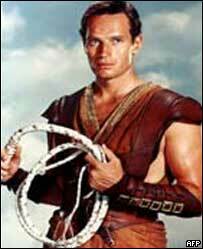 What to say...Ben Hur...The ten commandments...great actor, goodbye. "Take your stinking paws off of me you damn dirty ape!" I love Planet of the Apes. One of my fav scifi's. FX and stomps: T.C Electronics G-Sharp, Korg SDD-1200, Emma Transmorgrifier, BYOC Tribooster, GGG Green Ringer, Dinosaur Overdrive, Voodoo Lab SuperFuzz, Sovtek Bassballs, Line6 Tap Tremolo, EHX Screaming Bird. I kinda liked him cuz of his involvement in the NRA. If we aren't supposed to eat animals, why are they made out of meat ? Yeah, Omega Man was probably better than I am Legend, IMO. Although they are the Same Story.